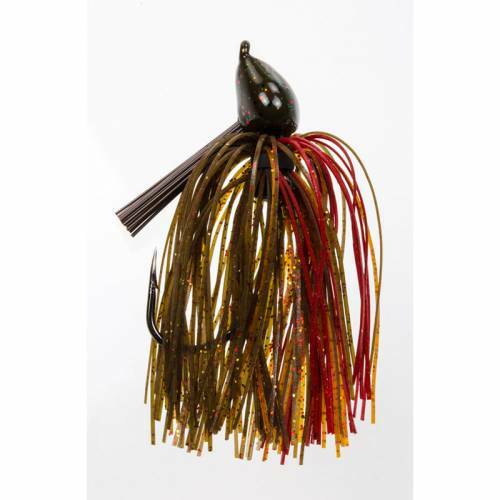 Strike King Denny Brauer Structure Jig - 3/4oz Falcon Lake Craw. Designed by renown fisherman Denny Brauer to offer increased strike-to-hookup ratio and decreased hang-ups. Features a super-sharp 2X strong hook and a 0-degree line tie for straight pull and solid penetration. The skirting in the hook gap has been thinnned to ensure less interference between the point of the hook and mouth of the fish. Designed with the Cobra-Head for increased sensitivity and reduced lip blow-out. One of the best jigs for tossing around structure, snagging is reduced with a precisely positioned fiber weedguard. Assorted colors available.